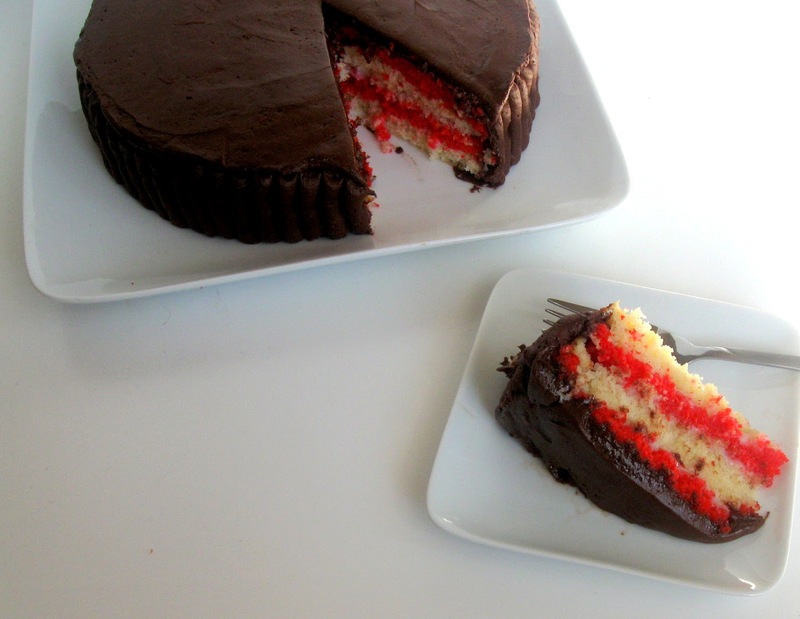 Double Chocolate Peppermint Cake & the 4th week of the Blog Hop! I'm simultaneously working on Christmas treats and Halloween treats in my head most of the time. I've been trying out some recipes this week and thought I had an awesome Halloween treat but the result wasn't what I wanted so I need to keep working on it. On the other hand, I made this cake which is filled with white chocolate ganache, frosted with dark chocolate frosting, and composed of fluffy peppermint cake! I thought this cake would look really pretty on a dessert table for Christmas because of the red and white color and peppermint flavor. I had another idea in mind for the design of this cake but the cake was fluffier than I anticipated, which is okay, I just changed my design and made the four layers. I like the way it turned out though, similar to a candy cane, which is what I was initially going for. 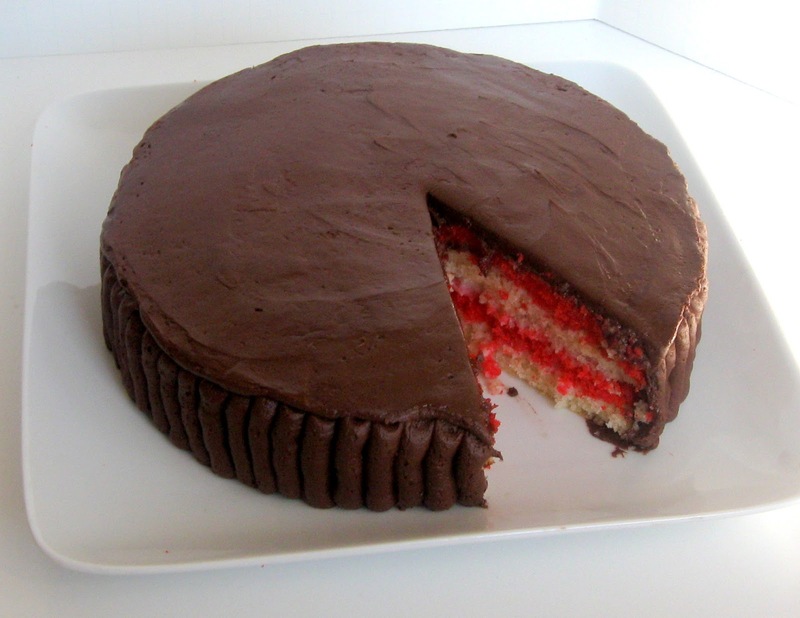 If you don't want to cut the cake of course you could just trim the tops and have a red layer and a white layer. The peppermint flavoring is in both layers so the stacking is more for aesthetic purposes. This is a long recipe, but don't let that scare you, it's not difficult. This week 4 of the 12 Weeks of Christmas Blog Hop. The hop is hosted by Brenda at Meal Planning Magic. She's kind enough to orchestrate the whole hop and let all of us be a part of it. If you would like more information on how to join the hop check out her site and she can help you get everything you need. First the recipe, then the hop :) Happy baking and exploring! 1. Preheat the oven to 350F. Spray 2 - 8” cake pans with non-stick pan spray and line the bottoms with parchment paper cut to fit. Whisk together the milk, egg whites, and vanilla until just mixed. 2. In the bowl of a mixer add the flour, sugar, baking powder, and salt. Add the butter, using a paddle attachment, turn the mixer on low and add in ¼ cup of the milk mixture. Mix until the ingredients are moistened, about 30 seconds. On medium speed, mix the batter for about 30 seconds until it comes together then increase the speed to medium high and mix for about 2 minutes, scraping the bowl once. 3. With the mixer on low, slowly add the rest of the milk mixture. Once all of the milk mixture is added then mix until the batter is light, on medium high, about 30 seconds. 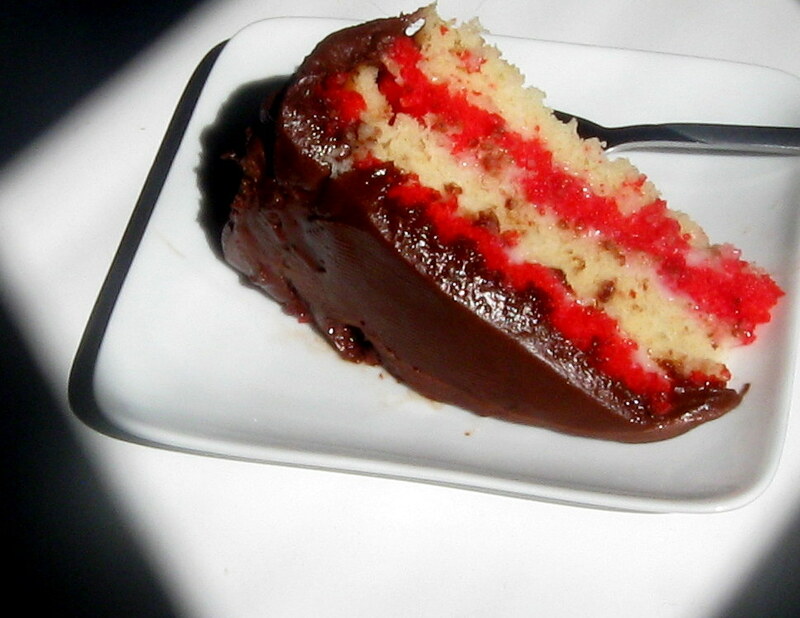 Pour half of the batter into another bowl and add the red food coloring. Stir until combined. 4. Pour the batter into the prepared pans and bake 28-30 minutes or until a toothpick inserted just off center comes out clean. Cool in pan on wire rack for about 5 minutes then invert onto wire racks and cool completely. 5. While the cake is baking prepare the white chocolate ganache. Place the white chocolate chips into a medium bowl. In the microwave heat the whipping cream about 45 seconds, or until it starts to bubble. Watch it carefully to ensure it does not overflow the the cup or bowl it is in, it would happen quickly. Pour the heated whipping cream over the white chocolate and let it sit about 15 seconds, then stir until the mixture is smooth. Cool in refrigerator, stirring occasionally, until it is a spreadable consistency. 6. Prepare frosting: In the bowl of a mixer cream together the butter and vanilla. Add 1 cup of the powdered sugar and ¼ cup of the cocoa powder. Mix on low speed until mostly combines. Repeat two more times until all of the powdered sugar and cocoa are mixed in. Add the milk slowly in a steady stream, on low speed, until the frosting is the consistency desired. Turn the mixer up to medium speed and mix for about 5 minutes until the frosting fluffy. 7. If desired, before cutting, freeze the layers (wrapped in plastic) for 30 minutes to an hour to firm up the cake a little. Cut each layer in half horizontally to create four layers (trim the top if necessary). On a cake plate layer the cake, spreading white chocolate ganache in between the layers. Frost with the chocolate frosting in the desired pattern (I had some chocolate frosting left over). What a pretty cake! Love the layering and the peppermint and chocolate flavors.